Haptic feedback can be utilized for solving a variety of different tasks in the virtual world. The identification of virtual shapes and objects is a particularly important task. Stamm et al. strived to detect the basic principles of shape and object identification in virtual worlds while conducting haptic identification experiments with numerous virtual models in a previous study. During the exploration and recognition process subjects experienced various difficulties that directly refer to the basic principles. One of those difficulties is subjects’ insufficient spatial orientation in the virtual scene. A promising approach refers to the utilization of auditory localization cues. However, it is important to investigate possible interaction effects of such a multimodal reproduction. This work investigates if the haptic recognition of geometrical characteristics could be influenced by simultaneously reproduced localization cues. 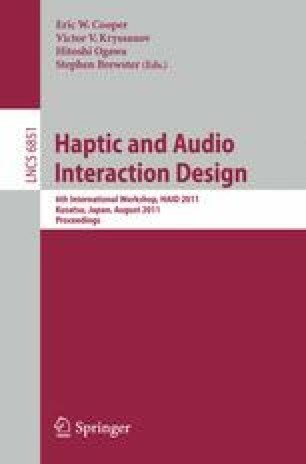 Specifically, it is investigated if the auditory localization direction influences the haptic length estimation of virtual objects.